The cast of the Arts Club Theatre Company production of Onegin. Photo by David Cooper. 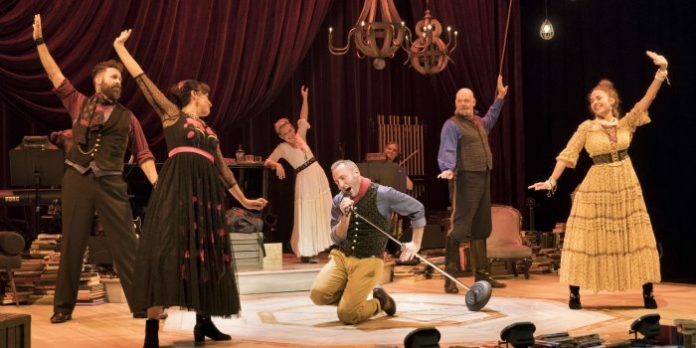 There is a reason the Arts Club Theatre Company’s Onegin virtually swept our city’s professional theatre awards last year, and why it was my top pick as the best of Vancouver theatre in 2016. Returning to our city, this time at the Granville Island Theatre, as part of its Western Canada tour, Onegin has not lost any of its charm. So, how do you top an already perfect show? The winning formula is in reuniting the original cast, and providing them with an opportunity to get reacquainted with each other, and their characters, by opening the tour in Victoria. By allowing time for each to fine-tune their roles before returning to Vancouver, the result is a fresh take, where the actors have mined even more of the gold in this Amiel Gladstone and Veda Hille penned musical. Based on Alexander Pushkin’s 19th century novel, and taking inspiration from Tchaikovsky’s opera, Onegin is the story of Evgeny Onegin who, after inheriting his uncle’s country estate, becomes embroiled in a love triangle, which ultimately leads to a duel. While perhaps a simplistic synopsis, it does underscore the clarity in which Gladstone and Hille tell this sweeping love story. But while Onegin’s storyline can be reduced to just a few words, it is far from unsophisticated. It is instead, a stylish and seamless tapestry of 19th century Russia, intricately woven together with a 21st century sensibility. How else can you explain a show where its characters reach for an electric guitar one moment, and call upon the audience to help deliver love notes in another? It is in within these moments of anachronism and self-awareness where Onegin really shines. 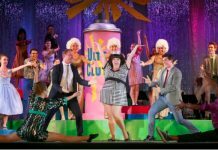 Helping to realize director Amiel Gladstone’s vision is a reunited cast who appear to be having the time of their life on stage. It is as infectious as it is stunning to watch. There was a near party atmosphere on opening night, no doubt in part simply by the show’s return to its birthplace, but also in a seemingly effortless execution. For anyone who saw the original 2016 production, the biggest change beyond venue is in the new depth this ensemble finds in their characters. While there is still a sense of play which permeates through the show, it is in the difference between Onegin’s lighter and darker moments where the emotional resonance has grown. It is all about nuance, and this cast finds every one. Real-life husband and wife Meg Roe and Alessandro Juliani continue to bring a fully-realized connection between Onegin and Tatyana, but with a new complexity. The lighter moments feel lighter, and the darker provides more shades of grey. Once again, Josh Epstein brings the star turn as the doomed poet Lensky. Finding a perfect balance of love and petty hate, he also has one of the best voices of the night. As his betrothed Olga, Lauren Jackson goes deeper as well, especially as she becomes bewildered by Lensky’s response to Onegin’s advances. Catriona Murphy also comes into her own in this production, no longer overshadowed by the musical’s main characters as she was in 2016. The two Andrews (Wheeler and McNee) continue to have a great deal of fun playing a range of characters, with McNee’s portrayal of the French entertainer Triquet once again a highlight. Led by Marguerite Witvoet on keyboards, alongside Jennifer Moersch (cello) and Barry Mirochnick (percussion), the trio relishes in Gladstone & Hille’s modern and idiosyncratic music. They are supplemented by a cast who are also called upon to play a number of instruments through the show. As a touring show, Drew Facey’s original set design has been appropriately edited, but like Jacqueline Firkins’ costumes, they are all a gorgeous mix of old-world elegance and the contemporary. It is all handsomely lit once again by John Webber. With so much theatre vying for attention during the busy holiday season, it is sometimes a difficult choice for audiences to make. 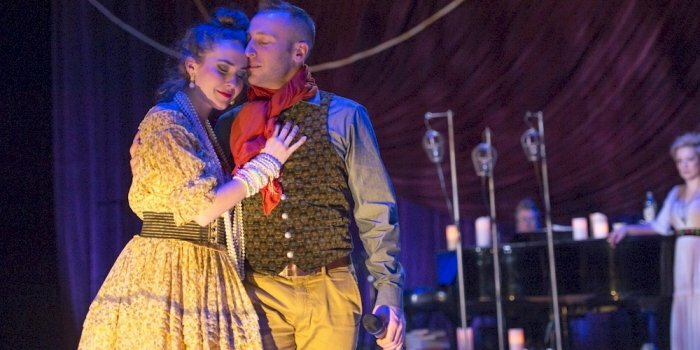 Onegin though is one of those rare theatrical moments which deserves to be seen; it is a show destined for greater things. Do yourself a favour and take advantage of this second chance and go see Onegin. Or go again, and fall in yublyu (love) with it all over again. Onegin by Veda Hille and Amiel Gladstone. Directed by Amiel Gladstone. Musical direction by Veda Hille. An Arts Club Theatre Company production on the Granville Island Stage (1585 Johnston St, Vancouver) until December 31. Visit http://artsclub.com for tickets and information.